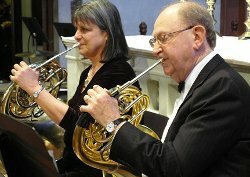 The Prometheus Symphony Orchestra is run by its volunteer members, who not only perform, but also sit on the Board, organize the music library, raise funds, sell ads and run concession stands. – Making sure audience members are respectful of Church property i.e. not playing with candle sticks, not bouncing up and down on the pews, etc. In appreciation for their service, Ushers are entitled to free coffee and food at intermission. Please contact me directly to discuss how you can help!